Haaa I typed Day 6 in and then heard Marcus Bentley's voice saying Day 6 in the Big Brother House!!! No idea why that popped into my head. Its Not day 6 in the BB house but day 6 of Christmas Chaos for Bugaboo!!! One of my oldest friends moves house tomorrow so thought I would do her and the family a cute wee new home at Christmas creation. Its meant to be freezing tomorrow but no rain forecast so fingers crossed that it all goes well. Papers HOTP and Creative Crafting World. Bugaboo Digi - Reindeer Ornament String. Catch the Bug - Colour Theme. Hazel, your card is adorable. Love your coloring. Thanks for joining us at the Holiday Chaos 2017 Color Challenge, Lisa Lynn GDT. I just love this card - the coloring is fabulous! Thanks so much for playin' along with the Bugaboo Stamps/Catch The Bug Holiday Chaos week long celebration!! We hope you'll join us for our 'naked' card challenge this week. Thanks so much for playing along with our Color challenge in our Holiday Chaos Challenge! I love your project! Thanks for helping to make our event a huge success! Lovely card. 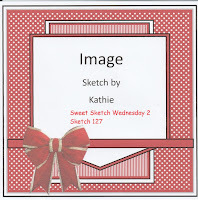 Thank you for joining the challenge at Sweet Sketch Wednesday 2. Hope to see you again next time. What a lovely card Hazel, what a great sentiment I do love this image. Great card and thanks so much for sharing it with us over at Sweet Sketch Wednesday 2 and good luck.